Florida Governor Rick Scott Photo credit: Florida Fish and Wildlife / Flickr (CC BY-ND 2.0). Many of the 1.6 million disenfranchised felons in Florida may be one step closer to being able to vote thanks to a ruling from a federal judge. Earlier this week, US District Judge Mark Walker ordered Gov. 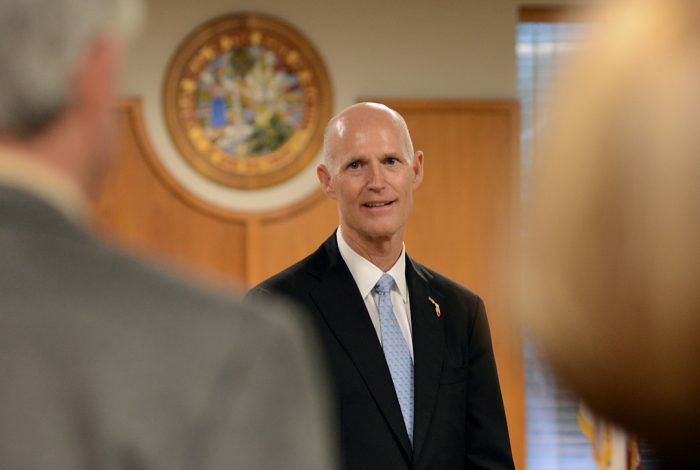 Rick Scott (R) to devise a new system to restore convicted felons’ right to vote by April 26. The court order from Walker requires Gov. Scott and the Executive Clemency Board, which manages voter restoration, to create and publicize “specific and neutral criteria to direct vote-restoration decisions,” and establish reasonable time frames for the restoration process. The permanent injunction follows Walker’s February 1, 2018 decision in Hand v. Scott, a class action lawsuit filed by the Fair Elections Legal Network (FELN), a nonpartisan voting rights and election reform organization, in March 2017. “This is a victory for the principle that the right to vote cannot be subjected to officials’ gut instincts and whims,” said Jon Sherman, senior counsel at the FELN. Scott devised the current system shortly after he was elected in 2011, though Florida has long stripped felons of the right to vote. Under Scott’s approach, felons have to wait between five and seven years after they complete their sentence, serve probation, and pay restitution before applying for voting rights restoration. Florida’s Executive Clemency Board, made up of the governor and three cabinet members, meets quarterly and usually reviews fewer than 100 cases at a time. According to FELN, there is a backlog of over 10,000 cases. Walker, however, described the current system as unconstitutional for placing convicted felons “at risk of viewpoint discrimination.” Disenfranchisement rates among African Americans in Florida were about 21 percent in 2016 — twice the state average. Denying or delaying voting rights restoration has a disproportionate effect on African Americans, who also by and large vote Democrat. Floridians have the chance to definitively change the voting landscape come November, when they will vote on a ballot initiative that would restore the right to vote to many convicted felons. If it passes, the initiative could lead to the registration of as many as 1.6 million voters in advance of the 2020 elections, and pave the way for similar actions in other states.